Summer refit. – Dirty wet dog , boats and sailing. You might be wondering why i am doing a refit right now in early summer at a time when most british sailors have woken up, found their boats and put them back in the water : in fact its ‘idiot time’ here with everyone who wasn’t particularly bright to start with all out on the water together ! 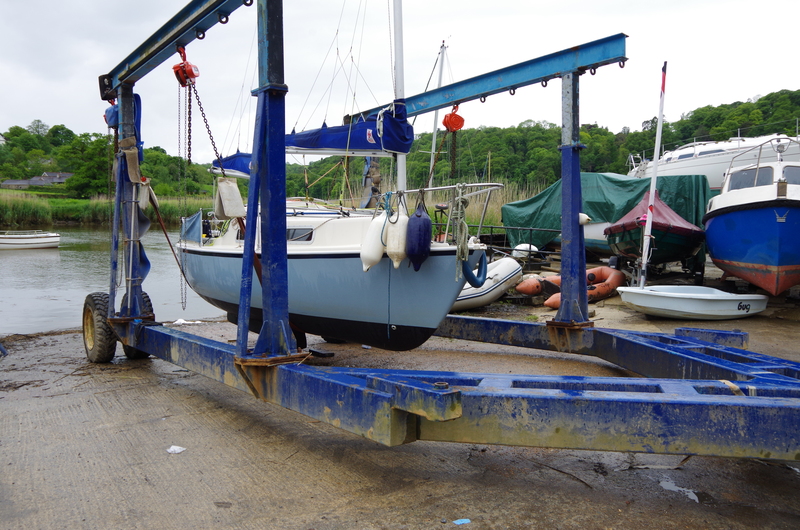 Well i am refitting now because i wasn’t able to get the boat onto the slipway before i left on the first stage of the trip, that is partially due to just one boat owner at the yard who was essentially blocking the slip and therefore the whole yard by not getting his work done….and he is still there today except that the yard has just about managed to work around him. Add to that the fact that i sailed right through the autumn and winter and i have already done the shakedown cruise : i did consider getting a lift-out at Mylor and good a yard as it is its also very expensive to do that there and i would have also had to travel back and forth with bits and tools to do the work that is now a 10 minute drive away or as now , in the workshop. With a nearly contiguous trip this is the way i will have to do things ie maintainence periods not just at the end of some hypothetical season but as and when things need doing. Right now the bottom needs a rub and scrub which is done, the engine needed a minor fix , the rudder is in the workshop and while that is being worked on intermittently i can also get on with another half a page of minor jobs. I only have about 12 hours of slip time and then the boat has to be back in the water to clear the slip, that isn’t going to be a problem without the rudder blade in as it can be shipped from a dinghy or during a one tide session on the hard . Having also tested the boat in a whole load of harder conditions i am also going to do a re-stow and lighten the boat slightly : i have been deliberately running ‘heavy’ and that has had some advantage when going upwind (i think) but does reduce the one good quality of its ability to ghost downwind in hardly any breeze so i will just take a little bit of weight off in the expectation that the next stage of the trip should be more downwind…given that our average conditions are west to south-west winds and i will be going east-about next. Previous The blades, the blades.